With a second baby on the way, I am being a lot more particular about the products that I MUST have. I saw super quickly with Zane which products were useful, a waste of money, and which didn’t stand the test of time with a baby. Bath time can be a total bonding experience with your baby or it can be super stressful as a new parent so being fully equipped is SO important!! I’m rounding up my MUST HAVE bath time products for new and experienced parents alike who are expecting a new baby! These items will also make amazing baby shower gifts! A light, portable and adjustable bath tub is a MUST. You don’t want one that’s only for newborns because you’ll be replacing it shortly after your baby arrives and one that isn’t specifically for newborns will drive you insane. You will either be constantly holding up your baby so that they are propped up, or you’ll have your baby constantly sliding down the slippery inclined plastic.. I recommend the Moby Smart Sling 3-Stage Tub. This tub is awesome because it grows with baby through three stages: Stage 1: Newborn (0-3 months; up to 15 lbs); Stage 2: Infant (3-6 months; up to 20 lbs); Stage 3: Sitters (6+ months; up to 25 lbs). There are 2 positions that you can place the tub in and then you can completely remove the interior mesh once your baby can comfortably sit. The mesh also provides a type of “grip” that a simple plastic tub won’t provide which is great for newborns. Click here to learn more. An easy to grip, light, ergonomic bath rinser. I love the Moby Waterfall Bath Rinser by Skip Hop. We actually have this one in blue and have used it since Zane was born! It’s designed to keep water out of your baby’s eyes and ears, it’s light, and the one we currently have has lasted us over 2 years already! We actually ordered a second one because Zane loves to help rinse himself off in the bath so now I can get him rinsed off and he can help too! Click here to learn more. A large and soft bath towel. Don’t make the mistake of getting a small newborn one… it will last about as long as your clean shirt with a new born. I totally recommend getting a larger one that is soft, has a large hood (Zane had a big head that never full fit in the new born towels) and one that is good quality so that it can withstand daily and sometimes 2 times a day baths! For Zane and our new baby, we have always used the Skip Hop Zoo Hooded Towel. It’s soft, bright and vibrant, and great quality! Click here to learn more. A SINK BATH! Before having Zane, I had never heard of these, and I won’t make the mistake of having another baby without using one! The Skip Hop Moby SoftSpot Sink Bather™ is the perfect size for newborns and infants. It allows you to give them a bath in the kitchen or bathroom sink. It’s GREAT for when you’re on the go, visiting your parents or friends houses and accidents happen. It’s also super practical when you’re alone and your baby has an accident. It’s hard sometimes to contain the mess, undress your baby all while trying to fill up a bathtub. With the Sink Bather, you can put your baby right in the sink and use the sprayer or tap to keep them warm and start bathing them immediately! 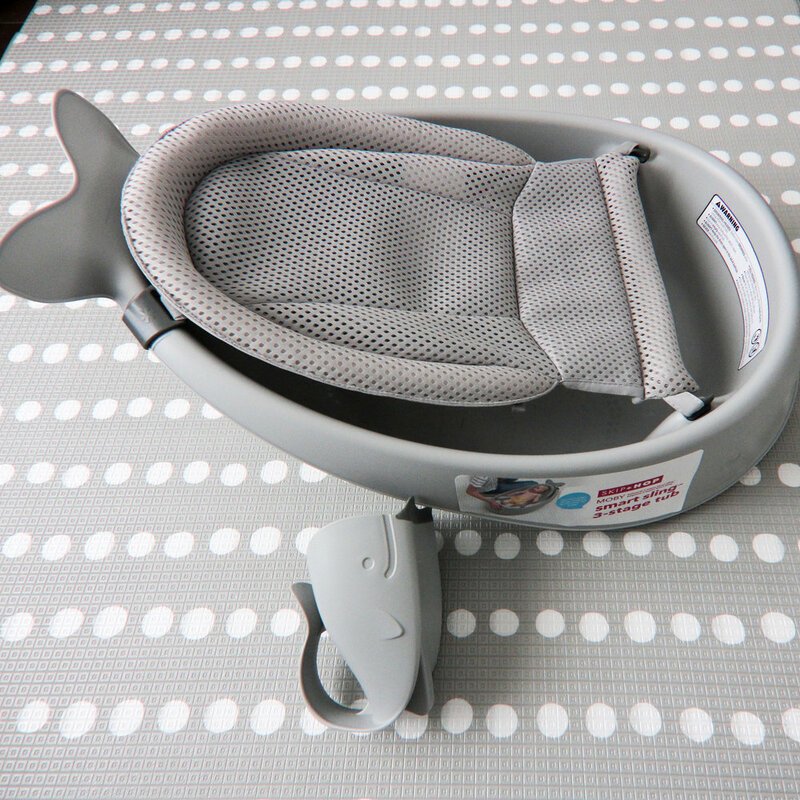 It has a velcro strap so that it can be easily hung to dry, it has neck and head support for babies and a mesh centre so that your baby is cradled. I am SO excited to give it try when our mini arrives in a few short weeks! Click here to learn more. Toys Toys and more Toys. They will keep your mini’s hands occupied and out of their soapy hair and will give you the time you need to properly wash them. I always recommend toys that move, toys that can easily be disinfected and toys that don’t have a ton of grooves and holes so that you don’t have any moldy surprises. 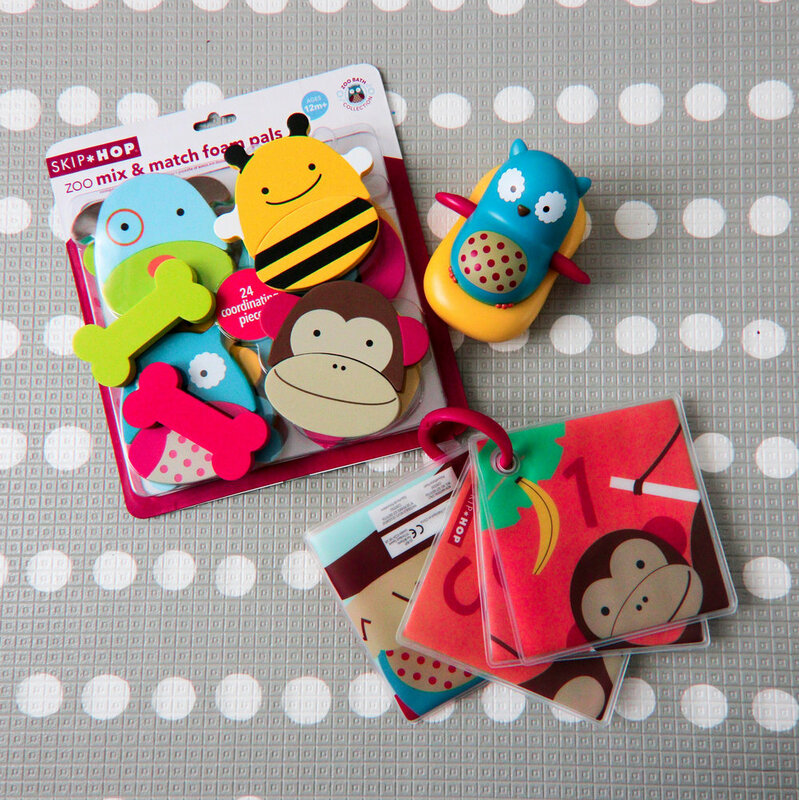 Our 3 fave right now are: Count & Play Bath Puzzle, Zoo Paddle & Go Owl and the Mix & Match Foam Pals Bath Toys (these actually stick to the sides of your tub and will keep your baby entertained and as grow with them as they learn that they can move them around and make different animal combinations! ).